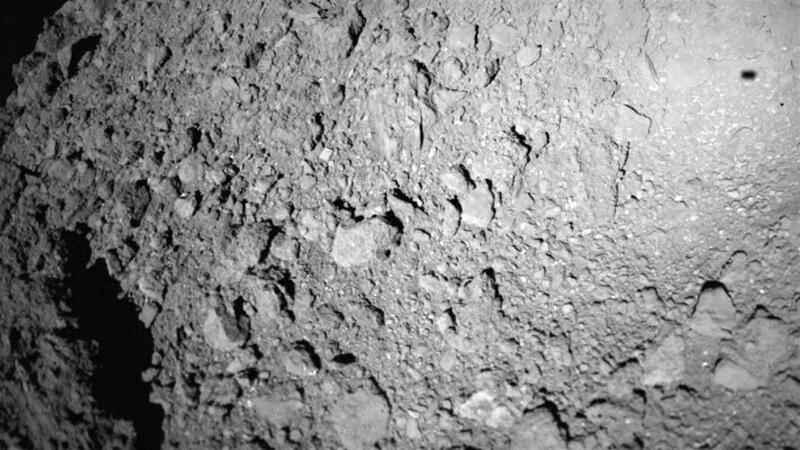 DLR's MASCAM camera on board MASCOT acquired this image as it descended to the asteroid Ryugu three and a half minutes after separating from its mothercraft Hayabusa2. In the image, the lander is approximately 20 metres above the asteroid's surface, and MASCOT's shadow can be seen at the top right. 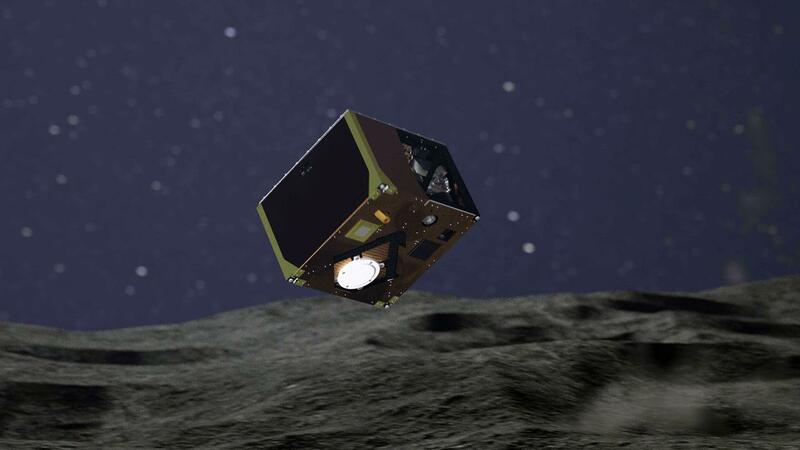 The near-Earth asteroid Ryugu, located approximately 300 million kilometres from Earth, has a new inhabitant: On 3 October 2018, the Mobile Asteroid Surface Scout (MASCOT) landed on the asteroid and began to work. The lander successfully separated from the Japanese Hayabusa2 space probe at 03:58 CEST. The 16 hours in which the lander will conduct measurements on the asteroid’s surface have begun for the international team of engineers and scientists. The day before, the Japanese Space Agency's Hayabusa2 began its descent towards Ryugu. MASCOT was ejected at an altitude of 51 metres and descended in free fall – slower than an earthly pedestrian – to its destination, the asteroid. 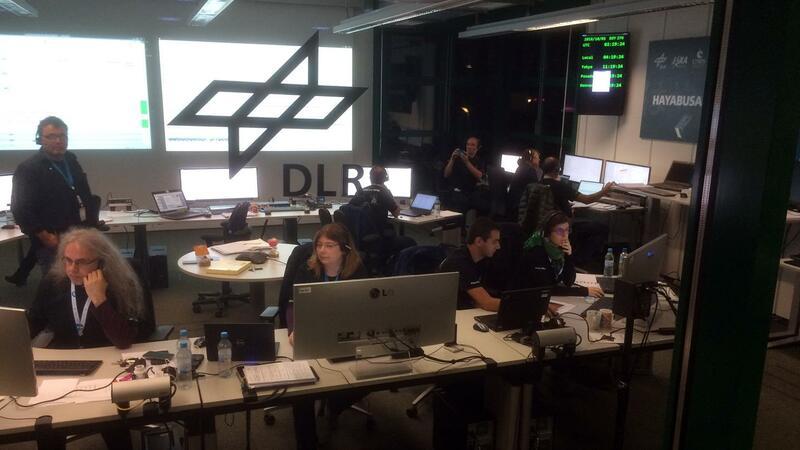 The relief about the successful separation and subsequent confirmation of the landing was clearly noticeable In the MASCOT Control Centre at the German Aerospace Center (Deutsches Zentrum für Luft- und Raumfahrt; DLR) as well as in the adjoining room: "It could not have gone better," explained MASCOT project manager Tra-Mi Ho from the DLR Institute of Space Systems. "From the lander's telemetry, we were able to see that it separated from the mothercraft, and made contact with the asteroid surface approximately 20 minutes later." The team is now in contact with the lander. The moment of separation was one of the risks of the mission: If MASCOT had not successfully separated from Hayabusa2 as planned and often tested, the lander’s team would hardly have had the opportunity to solve this problem. But everything went smoothly: Already during the descent on the asteroid, the camera switched MASCAM on and took 20 pictures, which are now stored on board the Japanese space probe. "The camera worked perfectly," says Ralf Jaumann, DLR planetary scientist and scientific director of the camera instrument. "The team's first images of the camera are therefore safe." The magnetometer team was also able to recognise in the data sent by MASCOT that the MASMAG instrument had switched on and performed measurements prior to the separation. "The measurements show the relatively weak field of the solar wind and the very strong magnetic disturbances caused by the spacecraft," explains Karl-Heinz Glaßmeier from the Technical University of Braunschweig. "At the moment of the separation, we expected a clear decrease of the interference field – and we were able to recognise this clearly." MASCOT came to rest on the surface approximately 20 minutes after the separation. Now, the team is analysing the data that MASCOT is sending to Earth to understand the events occurring on the asteroid Ryugu. The lander should now be on the asteroid’s surface, in the correct position thanks to its swing arm, and have started to conduct measurements independently. There are four instruments on board: a DLR camera and radiometer, an infrared spectrometer from the Institut d'Astrophysique Spatiale and a magnetometer from the TU Braunschweig. Once MASCOT has performed all planned measurements, it is expected to hop to another measuring location. This is the first time that scientists will receive data from different locations on an asteroid. "With MASCOT, we have the unique opportunity to study the Solar System’s most primordial material directly on an asteroid," emphasises DLR planetary researcher Ralf Jaumann. With the data acquired by MASCOT and the samples that Hayabusa2 brings to Earth from Ryugu in 2020, scientists will not only learn more about asteroids, but more about the formation of the Solar System. "Asteroids are very primordial celestial bodies."